Page F30: How many Germans remember World War II? How many Germans remember World War II? Slate has an article today on Germany's recent resentment at having become Europe's banker, especially for a proposed bailout of Greece which has a retirement age of 61 while Germany's has recently increased from 65 to 67. It notes astutely that Germany of today is run by people that have no memories of WWII and thus don't feel the sense of guilt the former generation did towards the rest of Europe. So how many people in Germany today remember WWII? Let's define 'remember' as being of an age capable of making one's own decisions at 1945, so we'll go with those born in 1930 and before. That means even those who are 80 were only on the fringe of adulthood near the end of the war. 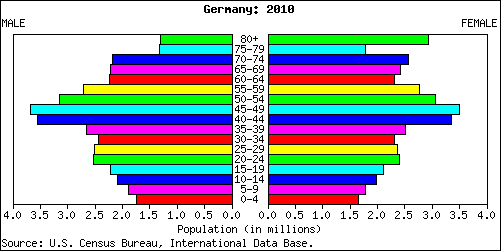 Now let's get out the German population pyramid for 2010. Looks like about 1.3 million men, and 3.0 million women. That's about 5% of the population.